Please tell us the age of all guests. Our reception closes at 7pm. Late check in is not possible. I need a tent(tents) and a sleeping bag(sleeping bags). I need a tent(tents) only. I will bring my goods. If you bring your tent, please put up in the garden. I agree with the cancellation policy below. Please be careful of your reservation. 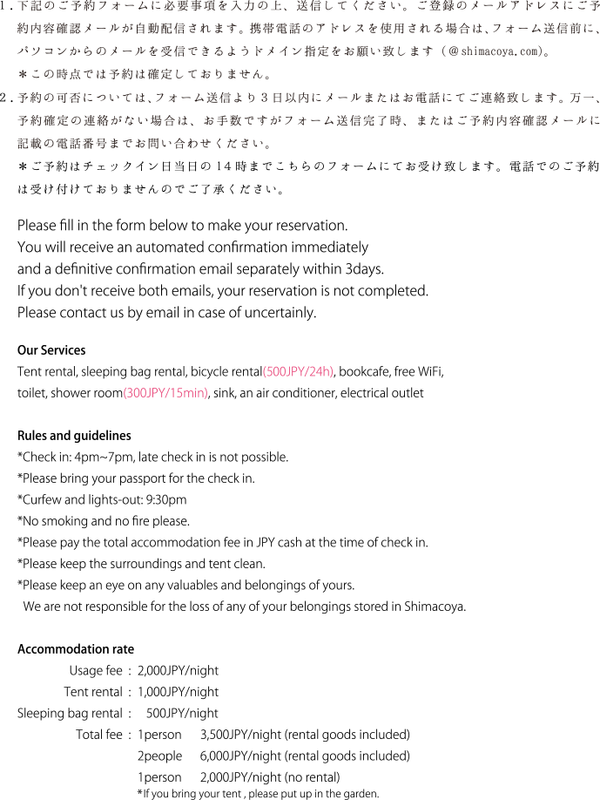 If you change only the detail of your reservation as the date, the number of the guest, the rental goods and so on, we will change cancellation fee according to the below policy. We have rental bike(500JPY/24h).If you want to rent it, please ask us at the time of check in.In addition, numbers are limited. When booking for 2 people, we usually prepare a tent. If you need each tent(2 tents),please indicate so above. Shimacoya is an accommodation and also cafe. So we have no water, boiled water, refrigerator, microwave. We can serve some foods and drinks.